40 fresh unsprayed vine leaves. Use a variety with big round leaves, such as chardonnay, semillon, colombard, malbec, grenache, mataro or perlette (a table grape). 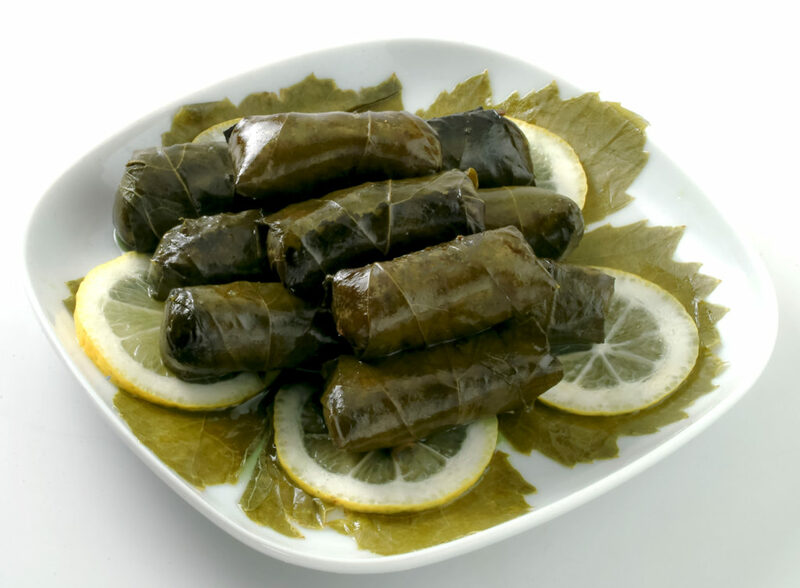 Or use a jar of vine leaves; these contain about 60 leaves. Heat the olive oil and fry the onion until glassy but not browned. Add rice and stir until the olive oil has been absorbed Add pine nuts and currants and stir for about 10 minutes. Add the salt, pepper, parsley and mint; set aside to cool. If using fresh vine leaves, trim the stalks off. Blanch leaves one at a time in boiling Verjus; keep the remaining Verjus for the poaching liquid. Drain leaves in a colander and lay out on the working bench or board with the underside (dull side) facing up. Keeping 6-8 leaves aside, fill each of the remaining leaves with about a teaspoon of the mixture and wrap up like a parcel. Place half of the reserved leaves on the base of a large heavy-based frying pan with a lid and add the stuffed vine leaves, seam side down. Layer the parcels on top of each other. Top with the remaining vine leaves. Add water to the reserved Verjus to make up to 2 cups. Pour this poaching liquid over the dolmades, place a plate on top to hold the dolmades together and simmer very gently for ¾ of an hour or until the rice is cooked.